Hegel's lectures have had as great a historical impact as the works he himself published. Important elements of his system are elaborated only in the lectures, especially those given in Berlin during the last decade of his life. The original editors conflated materials from different sources and dates, obscuring the development and logic of Hegel's thought. The Hegel Lectures series is based on a selection of extant and recently discovered transcripts and manuscripts. The original lecture series are reconstructed so that the structure of Hegel's argument can be followed. Each volume presents an accurate new translation accompanied by an editorial introduction and annotations on the text, which make possible the identification of Hegel's many allusions and sources. Hegel's Lectures on the History of Philosophy offer one of the best points of entry to his philosophical system. 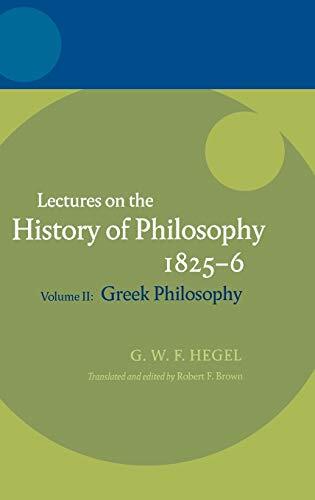 The second volume (dating from 1825-6) covers a thousand years of ancient Greek philosophy; this is the period to which Hegel devoted by far the most attention, and which he saw as absolutely fundamental for all that came after it. This edition sets forth clearly, and for the first time for the English reader, what Hegel actually said. It forms part of OUP's Hegel Lectures series, presenting accurate new translations accompanied by editorial introductions and annotations. These lectures challenged the antiquarianism of Hegel's contemporaries by boldly contending that the history of philosophy is itself philosophy, not just history. It portrays the journey of reason or spirit through time, as reason or spirit comes in stages to its full development and self-conscious existence, through the successive products of human intellect and activity. Hegel's Lectures on the History of Philosophy proved to be extremely influential on the intellectual history of the past two centuries. These lectures are crucial to understanding Hegel's own systematic philosophy in its constructive aspect, as well as his views on the centrality of reason in human history and culture. The volume on Greek Philosophy covers the first one thousand years, the period to which Hegel devoted by far the most attention, and which he saw as absolutely fundamental for all that came after it. This edition adapts the considerable editorial resources of the German edition that it translates, to the needs of the general reader as well as the serious scholar, so as to constitute an unparalleled resource on this topic in the English language. 4. Hegel: Lectures on the History of Philosophy 1825-6. Volume II: Greek Philosophy.